The saga of the milk bottle began a few days ago with the visit of two old friends of Rose Alice Wills Smith '31, who had told them about a "memento" she'd left behind "in the basement" at the Mount. The basement had to be Brady Hall's, and our intrepid archaeology sleuth John Deeb set out to try to discover what she was referring to. The excitement over the milk bottle had hardly subsided when John showed up unannounced in the Archives with a big smirk on his face and this handsome artifact. Rosie's memento. He came across it in a narrow gap near what might have been a coal chute in the 1930s. John managed to squeeze into the passageway and noticed the blob of cement some distance up the wall with the magic word "Rosie." It was hard to get a good look at it and even harder to take a picture, so he somewhat reluctantly pried it off and brought it to the Archives. 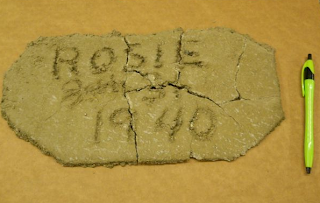 Besides "Rosie" and "1940" it seems to have "Jun '31," which would have been when Rose Alice graduated. But 1940? Did she come back 9 years later to leave her memento? And where did she get the wet cement? Don't we love the way one mystery is solved, only to reveal another?